Processions often take place before masses on Sundays and important feasts. The procession, accompanied with chants, may be made to another church (a station), for readings and prayers. The processions' hymns are sometimes assembled in a book called a processional. Made for an urban church dedicated to St Mary and with dependent suburban churches, this one may have been for Salisbury Cathedral, but one of its processions is adapted for the tradition (use) of Norwich and a procession with the relics of St Swithin suggests Winchester, too. A rare illustrated processional with diagrams of the positions of participants, the book also gives verbal descriptions, this one (in red) for the procession for the blessing of holy water. 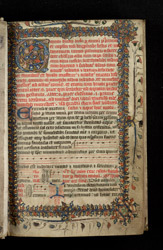 Lower on the page, the text in black presents some of the prayers, and further text in red relates to the hymns and responses, which are given musical notation.